The GameType tag defines the type of the draughts game, including the size of the board and the preferred notation. It has been previously defined on [Grimminck]. GameType "Type-number [,Start colour (W/B),Board width, Board height, Notation [,Invert-flag]]"
The game type is a number followed by some optional attributes. Several numbers are predefined, as given by the following table. A test page for the GameType tag can be found at gametype.html. *) Note that Pool checkers and Jamaican draughts have been added later. They have the same rules as American pool checkers, but they use algebraic notation, and white moves first. Moreover, in Jamaican draughts the direction of the numbering is vertical instead of horizontal. Zimbabwean is played on the light squares. All checkers variants share the number 23, but the abbreviated version [GameType "23"] still expands to [GameType "23,B,8,8,N1,0"] (American pool checkers). The game types 29, 30, 31, 40 and 41 are not listed in [Wikipedia], but they were added based on conventions of the game site Play OK and the program Aurora Borealis. N = numeric like draughts. S = SAN - short-form notation. The interpretation of the Invert-flag has been changed! The previous interpretation (0 = Play on dark squares, 1 = Play on light squares) was not accurate for certain game types. The Start-colour field is just an indication for the colour of the pieces, but it has no influence on the notation. The principal direction of the notation is assumed to be horizontal. This means that square 2 is always to the left or to the right of square 1. Usually the game is played on the dark squares. 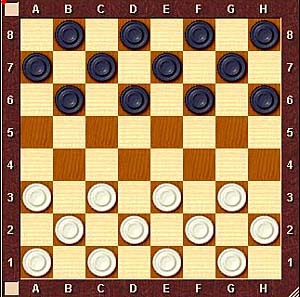 For Italian draughts the first square (1) is located in the top left corner of the board. The next square (2) can be found by moving in horizontal direction to the right. Therefore Italian draughts gets the notation number 2, that corresponds with (Top left, horizontal).